Dryerballs are designed to reduce drying time and soften fabrics without using fabric softeners. As Dryerballs tumble around in the dryer they lift and separate your clothes. This allows the air to flow more efficiently and reduce drying time. 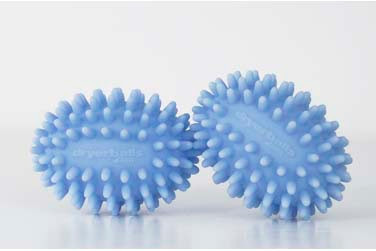 The Dryerballs nodules help relax the fibers so clothes feel softer and towels are more absorbent. I got a good deal on some from e-bay a month or so ago. So far I am pleased with the results!